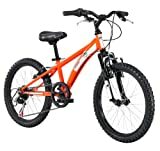 The Diamondback Bicycles 2014 Cobra Junior Boy’s Mountain Bike offers a great ride and it is well designed to meet the riding needs of junior boys. With its powerful frame made from Heavy Duty Steel, it sure can support the average kid’s weight. It comes designed with an excellent suspension Fork which serves to insulate the rider when cycling through rough terrain. It also sports a 20 inch Aluminium Wheel, a 6-Speed Freewheel for easy gear shifting and offers both front and rear brake system for effective braking. Shimano Gear system and Shifter for easy, smooth, fast and seamless shifting of gears. Heavy Duty Steel Frame offering superb sturdiness and durability. HL Corp Zoom suspension fork offering 30mm of travel thereby proving enough insulation against uneven and rough terrain. Comes in bright orange colour for aesthetics. 36 Spoke, 20” Wheels made from Aluminium offering superb and great ride. Weighing just 35.4 pounds, the bike is small enough to be attached to the back of a SUV or even fit in the trunk of a car. The Diamondback Bicycles 2014 Cobra Junior Boy’s Mountain Bike is a very great and durable bike for juniors. The 6 Speed freewheel makes it even fantastic and riding can be adjusted for better comfort. The bicycle is very well designed, well-built and smoothly finished with a nice paint job. The pedals and gear derailleur offers a smooth ride. It is nice and sturdy and will take the wear that kids dish out. The Steel frame of the bike makes it heavier than its Aluminium counterpart and the wheel hubs more so than the chain and gears would have been great with more lubrication. It does not come with a kickstand which is not really a big deal. Generally the bike performs well for a junior boy’s bike during mountain biking and with better lubrication of the hubs, chain and gears, it offers a great value for money and definitely worth buying.